View More In Breast Pump Accessories. Chic, classic and timeless, the nautical "Abby" is the perfect breast pump bag for the stylish mama on the go! There are limitless ways to style this fashionable, yet neutral breast pump tote from the cross-body strap to the 100% real leather comfort handles. 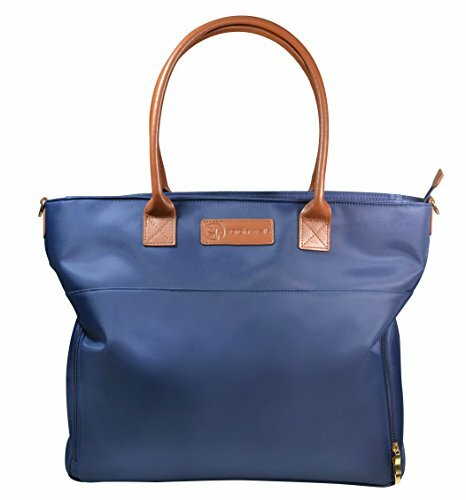 With room for breast pump, pumping accessories, keys, laptop, phone, and more, this bag is ideal for the always-stylish mama! Fits portable pumps including: Medela Pump in Style (with or without a case) and Freestyle, Hygeia, Freemie, Spectra, Ardo and Ameda and more! If you have any questions about this product by Sarah Wells, contact us by completing and submitting the form below. If you are looking for a specif part number, please include it with your message.